Global Aerospace Corporation is developing a system for de-orbit of satellites and large orbital debris objects. This system concept uses a lightweight, inflated envelope to increase the drag area and accelerate the natural orbit decay process by orders of magnitude. Potential uses of this system include de-orbit of antiquated satellites, micro-satellites, upper stages, and uncooperative satellites in orbits up to about 1,200 km altitude. The de-orbit device can be attached to satellites or upper stages before launch, delivered to multiple debris objects by orbital tenders, or used for targeted and controlled reentry of large space platforms. The Gossamer Orbit Lowering Device (GOLD) system increases the cross-section area of a satellite, thereby amplifying the atmospheric drag effect, or momentum exchange with atmospheric molecules. This momentum exchange results in a reduction of satellite orbit energy and subsequent orbit lowering without increasing the effective collision cross-section Area-Time Product (ATP) for low- and high-energy collisions that can endanger operating satellites or generate new orbital debris objects. GOLD’s effective collision cross-section ATP is a factor of about 700 times lower than the satellite alone for high-energy (hard-body-to-hard-body) collisions because the large drag area significantly reduces decay time and because GOLD operates near solar maximum periods when atmospheric densities are higher. Space debris has been a growing problem in many highly-populated orbital regions, despite numerous and pervasive debris mitigation policies enacted and followed internationally. A major example was the collision in low Earth orbit (LEO) of an operational Iridium satellite with a defunct Russian satellite in 2009. The collision yielded nearly 2000 trackable objects and possibly tens of thousands of smaller, yet still lethal, fragments. This underscores the need for an ability to safely de-orbit large objects from popular, congested orbital regions: specifically in the 750-900 km altitude range. A large, ultra-lightweight and thin, inflatable envelope that reduces object ballistic coefficient by up to two orders of magnitude. The envelope is protected against damage from ultraviolet radiation and atomic oxygen. The GOLD system requires very little mass and power, does not require an operating satellite, functions autonomously, does not generate orbit debris, can be designed and integrated into space vehicles, can be used to de-orbit small satellites that have no propulsion systems, can be installed on derelict space objects already in orbit, and is very simple in design. GOLD is capable of deorbiting satellites over a wide range of sizes, from CubeSats to much larger satellites and space stations. GOLD has a lower risk of destroying operating satellites or creating debris compared with other deorbiting systems: specifically, bare spacecraft or other non-propulsive de-orbit devices such as electromagnetic tethers, gravity gradient drag tapes, or boom-supported thin film aerobrakes. GOLD consists of an inflation-maintained ultrathin envelope. Gas, sensors, and controls carried along enable inflation and pressure maintenance in the Earth’s meteoroid and orbital debris environment. Only a small amount of gas is required because the pressures are exceedingly low. If particles create holes in the balloon, leaking gas is replenished to maintain proper pressure. In addition, as the ambient stagnation pressure increases as the balloon reaches lower altitudes, the pressure within the envelope is increased in response. External forces are counteracted by envelope design and internal pressure within the envelope. Why not use the satellite’s propulsion system for deorbiting? The cost of propulsive deorbit from a high parking orbit can be very high in terms of launch mass requirements and satellite cost. The cost would be lower if the satellite’s orbit decays through increasing atmospheric drag. Fuel is required to lower the satellite to a part of the atmosphere with high enough density to create sufficient drag; the amount of fuel could account for 10-20% of the total mass of the spacecraft, depending on propellant type and orbit altitude. This added mass in turn increases launch costs and limits the amount of scientific hardware that can be added, thus limiting the yield of scientific data. What about satellites that did not originally require a propulsion system? Adding a system specifically to control deorbiting could be expensive—up to 10%-20% of the satellite’s cost. Two objects orbiting the Earth are not likely to approach each other at low enough velocities that impact would result in less damage: the objects would have to be slowed down by propulsion systems and this would use up too much fuel. The objects’ relative velocities, exceeding their orbital velocities, would be at “hypervelocity,” or higher than the speed of sound would be within each object. At such a velocity, impact would severely damage if not destroy the two objects, yielding space debris. The situation becomes more complex when the objects are satellites, because of the variety of materials and shapes. The area-time product (ATP) is the projected area of an object as viewed along its orbital flight path, multiplied by the time the object spends in orbit. The risk of collision increases with ATP. The Figure below shows the results of an analysis of the collision ATP and hypervelocity impacts with components of several deorbit methods following end of mission. The collision ATP for deorbit methods are shown as horizontal bars in order of decreasing threat of creating many new, large debris objects by “high-energy” collisions. The results of the analysis indicate that a rigidizable space inflatable sphere has the highest risk of creating debris by high-energy collisions with other objects. 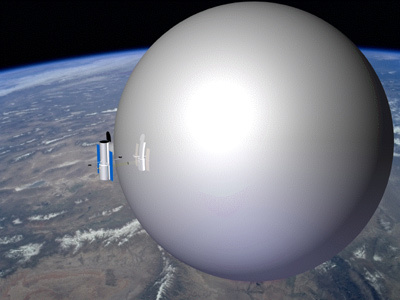 A rigidizable space inflatable sphere has an areal density high enough that if it were to collide with a satellite, the impact would generate a high enough energy to mass ratio that the satellite would be destroyed, yielding many large debris fragments. Impact with booms would have a high enough linear density to maintain their integrity, but said linear density would result in generation of enough energy to destroy a colliding satellite. The next highest risk is using residual propellant to lower the orbit to an altitude from which it will decay in 25 years. A lone spacecraft takes several centuries to deorbit, and all its collisions are high-energy because all collisions are with the hard body (spacecraft). De-orbiting via a propulsion system would reduce deorbiting time such that the integrated area time product is negligible. This leads to the lowest risk of collision with debris. However, this approach is expensive in terms of fuel consumption and addition of mass, taking away from the mass allowance allocated to mission-specific hardware. Electromagnetic tether, gravity gradient tape, and inflated maintained ultrathin envelope deorbit methods have the lowest risk, besides immediate propulsive deorbit, of creating new, large debris due to their small ATP for high-energy collisions. However, tethers and tapes have a very high risk of disabling operating spacecraft due to their large ATP for low-energy collisions. At the same time, booms, tethers and other extended object drag-generating systems themselves can be damaged by collisions. The longer and thinner the structure, the higher the chance of damage, especially given the number of possible impacts in LEO by small meteoroid and orbital debris (MOD) particles. This number is estimated at 200 impacts per square meter per year, according to the NASA Orbital Debris Environment Model 2000, for an 833 km altitude, 98.2 degree inclination orbit (see reference 10 in Nock and Aaron 2013). The likelihood of impact is minimized by the use of shorter booms and multistrand tethers. Thin film balloons are also more likely to undergo damage from collision with smaller objects such as meteoroids; however, the number of holes generated will not lead to a high amount of gas leakage, and smaller particles will generate craters in the film rather than outright holes. Other than immediate propulsive deorbit, ultrathin inflation-maintained drag envelopes such as GOLD pose the lowest risk of disabling nonmaneuverable operational spacecraft, and they also have the lowest risk of creating new debris during the short deorbit period. The table below shows a comparison of de-orbit methods for different attributes.